Food in Saigon (Ho Chi Minh City) represents Vietnamese cuisine in both cooking elements and diversity. At first glance, eating out seems to be the favourite pastime for locals, given the numerous food stalls and amount of cooking that goes on. From simple dishes to high calories meals, you’ll find casual dining spots, street stalls, and high end restaurants creating similar dishes but with a unique flavour and twist. An interesting aspect of eating out in Saigon is the presence of eateries specialising in noodles, rice sandwiches or soups. 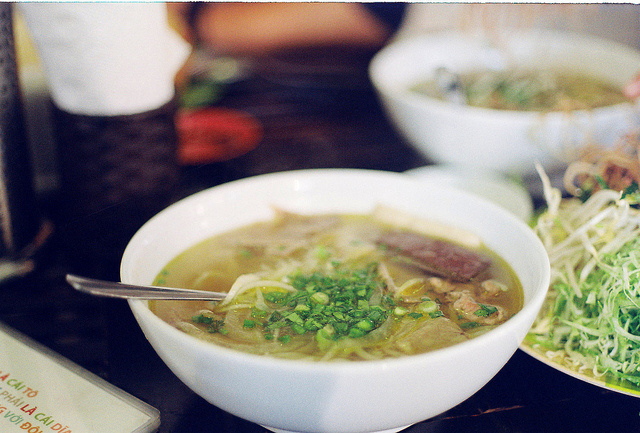 You’ll find pho, banh, cam and che joints across the city. The dishes may use a lot of common ingredients, but each one has an exclusive taste. These are single meal dishes served with different sides or sauces. This guide isn’t focused on the top ten dishes, but the foods you should try when you plan a proper food tour in Saigon! You won’t be wrong if you called Vietnam a Noodle Soup Land! Bun Rieu is made with crab stock and has a sweet, tarty, and seafood flavour to it. Tomatoes, long rice noodles and crab meat stock are the main ingredients, while some recipes add rice vinegar for sourness. The soup has toppings like deep fried tofu, meatballs, pork chunks, congealed pig’s blood, and crab paste. Some eat this with an extra garnish of shrimp paste, herbs, shredded vegetables, chilli sauce or lime juice. The Chinese Teochew (rice cake) has found its way into many South-East Asian cuisines from Singaporean to Thai. While other versions include vegetables like radish and carrots, Vietnamese Bot Chien only contains sticky rice flour and tapioca starch. The bite sized rice cakes are lightly seasoned and fried in lard. These cakes are then topped with eggs, shredded green papaya or green onions, and served with a sweet-sour sauce made with vinegar and soy sauce. 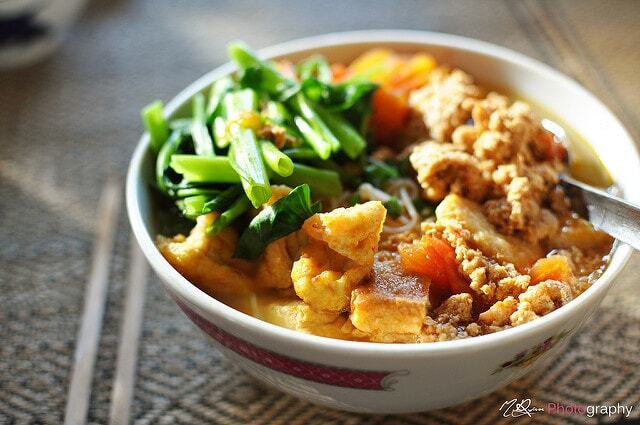 Bun Mam is a soup noodle from Southern Vietnam. Not as popular as street food soups like Bun Rieu, this one has fermented fish sauce as a broth base. Vermicelli noodles are liberally doused in the dark coloured broth and topped with eggplant slices and meats like prawns, pork belly or squid bits. 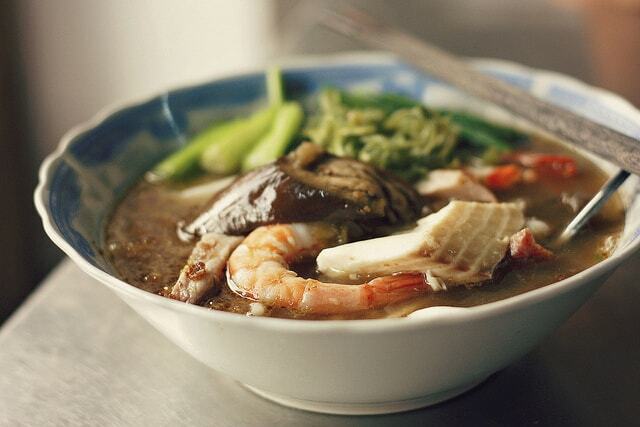 The addition of sugar and tamarind juice gives the noodle soup its tangy-sweet flavour. If you love coconut milk, you’ll enjoy this one. 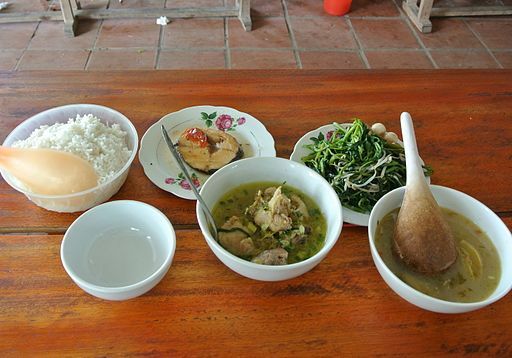 The dish comprises of a bottom layer of chopped herbs like sweet basil and Vietnam cilantro, followed by a layer of thick, sticky rice noodles, pork meat and pig skin scoops. 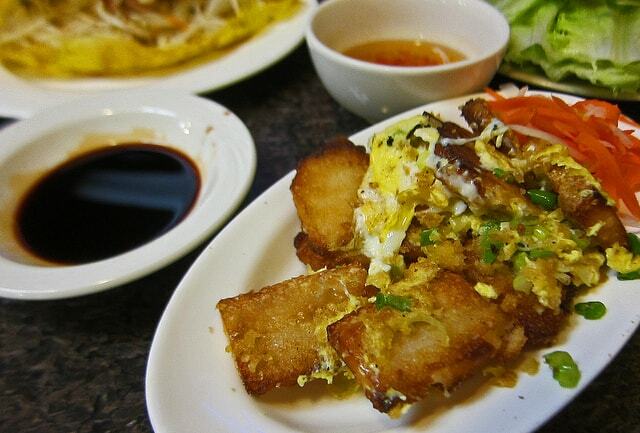 Banh Tam Bi comes with topping like green onions and coconut cream sauce. The soft noodles, delicate herbs and coconut cream lend a buttery texture and a sweet flavour to the dish. If you’re bored of the usual Pho, try this beef based dish from Hue city that is quite popular in Saigon. Rice vermicelli noodles are served in beef bone and lemongrass broth. Other ingredients include beef slices, pork knuckles, ham and sausage, sweet onions, vegetables and ox tail. The dish has a distinct umami essence with a prominent sweet, salty and tangy taste. Rice lovers will especially enjoy this popular street food in Saigon – Com Tan Suon. This dish with grilled pork chops and broken rice can be eaten at any time of the day. It is usually served with fish sauce, green onion infused oil, cucumber pickle, and chillies. Variations include Com Tan Suon topped with eggs, meatloaf, extra sausage and pork or pig skin. These pancakes sliders are as popular as Vietnamese crepes, Banh Xeo. 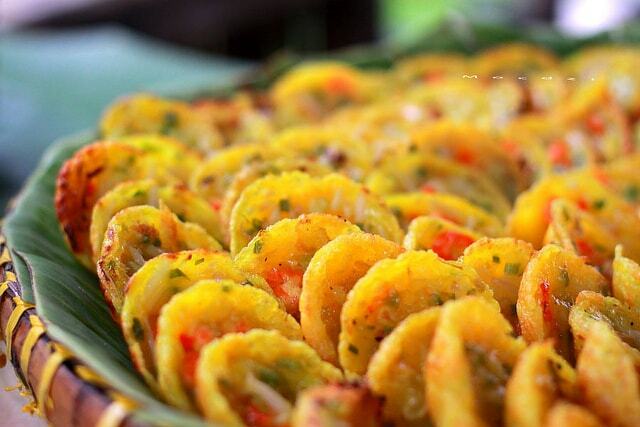 A perfect snack, Banh Khot is made with leftover rice or rice flour, turmeric powder and coconut milk. The batter is cooked in a hot griddle into small golden brown pancakes with toppings like shrimp and green onions. Lettuce leaves, chopped herbs, mustard leaves and leafy greens, sweet fish sauce are served as sides. This is rich (curry) dish similar to Malaysia’s Nasi Campur and Thailand’s Khao Gaeng. It is is a filling meal of rice and assorted side dishes including braised pork belly, fish, tofu stew, vegetables and meat. You simply order a bowl of rice and choose various stews and curries as accompaniments. While banh mi is a popular street food in Saigon, it can get repetitive after a while. This crusty baguette sandwich is a tasty alternative. Pan-cooked eggs are served in a sandwich with slices of fried meat and caramelised onions. 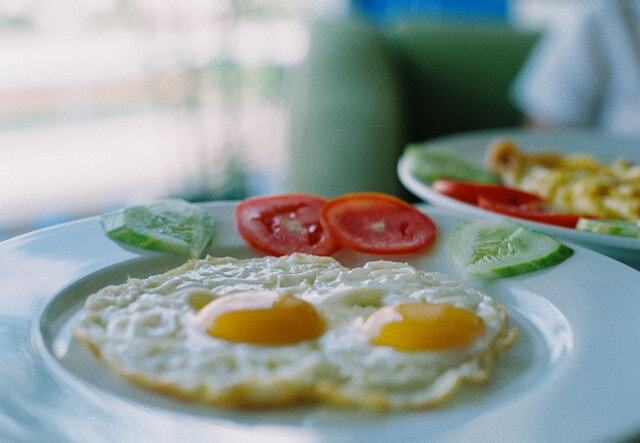 This fusion dish with sunny side up eggs has variations that include peppers and other ingredients. 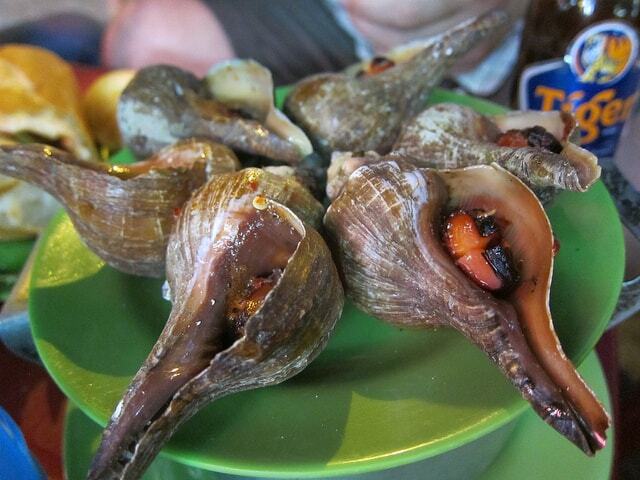 If you’re looking for an unusual dish in Saigon, try this dish. Oc is basically saltwater snails cooked to your specification. This also includes any cooked shell food like clams, cockles, or crab. You choose the raw seafood and cooking method. Order small plates of snails that are grilled, steamed, sautéed, curried, fried or coated in chilli and salt. Enjoy them with a glass of beer. If you can’t have enough of beef, try some Bo la Lot. 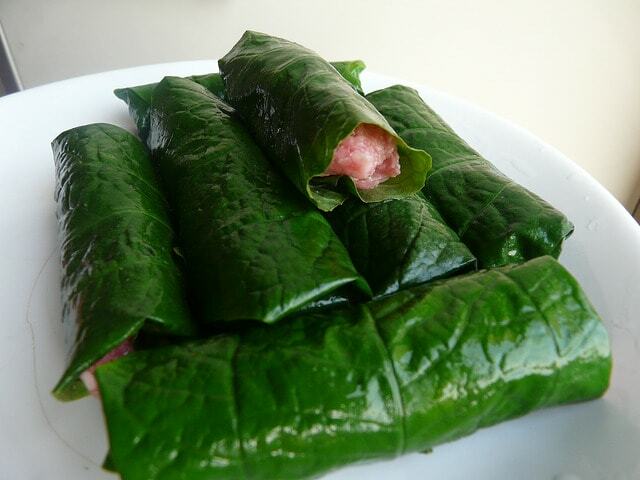 Wild betel leaves are filled with lightly seasoned minced beef and tightly rolled into tubes. These are grilled on charcoal giving the rolls a lovely smoky flavour. Bo la Lot is served with rice paper, herbs, leafy green, chillies and fermented fish sauce. 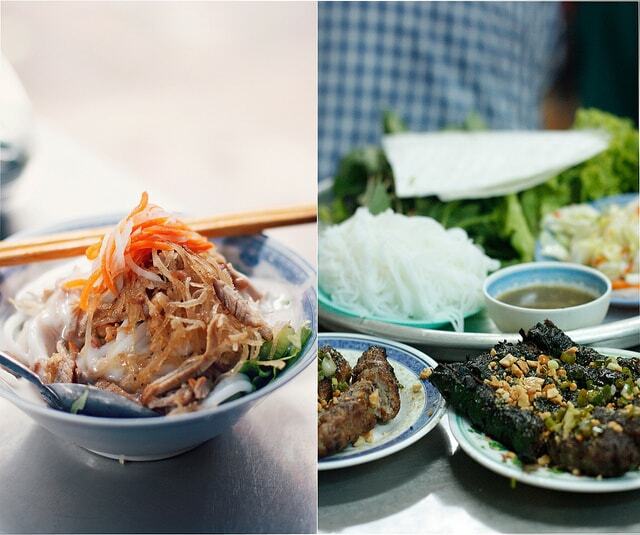 Have you tried these dishes in Saigon? Do you have your own favourites? Omg! The pancake with shrimp looks yummy! I have never seen this before. I would love to try this. Wow, I love your pictures and descriptions of these dishes. They make me want to book a trip to Saigon to experience the food and culture. I think I would start with the Bun Mam. 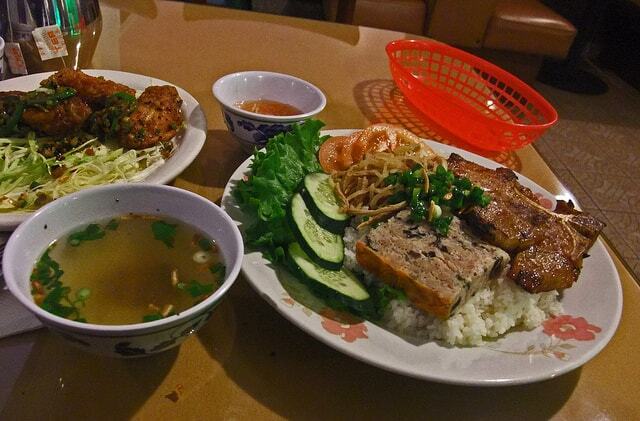 The Bún Mắm sounds amazing! I love fish broth (strangely enough) and adding extra seafood for more flavour is such a great combo! And I love the taste of tamarind so this would be something I would definitely try! Tamarind is my absolute favourite – we invented a lot of exciting dishes adding it to the dishes from European cuisine! That food looks unbelievable! WOW!